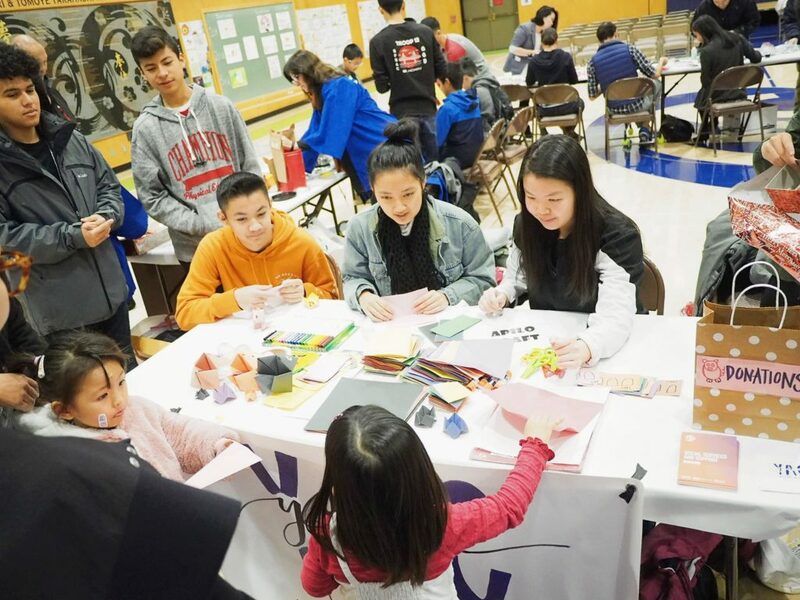 On January 5th, 2019, the Youth Advisory Council celebrated the 48th annual Oshogatsu Matsuri in San Francisco’s Japantown. This year’s Oshogatsu Matsuri honored the boar. The festival brought together the community as we centered culture and tradition. YAC interns were invited to be a part of the celebration; we ran both a food station and crafts station for the children at Oshogatsu. While serving hot plates of chicken katsu and potato salad, we saw the traditional process of mochi-making and t-shirt screen printing. Upstairs, our crafts station attracted the attention of younger children. We guided the youth in making little boar paper fortune-tellers, also known as cootie-catchers; the children used this opportunity to let their creativity run wild as they drew and colored their own unique designs. At the same time, many cultural performances were held on stage by the community, such as kendo demonstrations, youth drumming, dancing, and singing. The once quiet gym quickly filled with laughter, conversations, and hope for the new year. It was very interesting and exciting to see the diverse performances, and we learned a lot about Japanese culture within a few hours. Other booths held different creative projects for the children, while the walls hung art done by children in honor of the year of the boar. The event incorporated a wonderful balance of celebration and information about the rich Japanese culture. Though the day was cold and gloomy, all our hearts were warm and filled with a strong sense of community and unity. This entry was posted in YAC News and tagged AAPI community, AAPI culture, community, San Francisco. Bookmark the permalink.